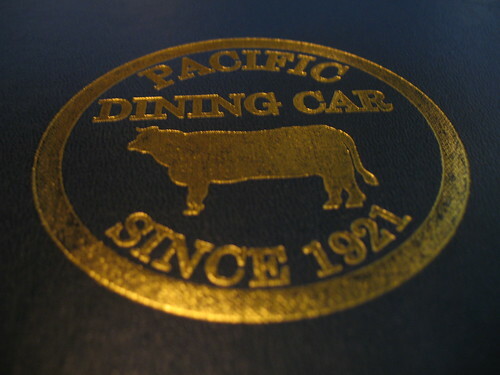 Mansmell and I had dinner at Pacific Dining Car on Thursday. Yummers. PDC is deliciously dark and old-school. It's the perfect restaurant for a man's man. 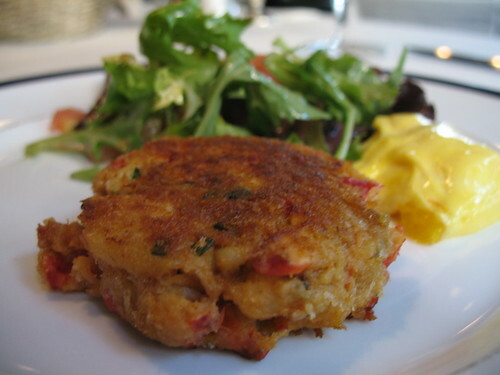 We started with some lobster cakes. No filler here. The real deal. Fantastic with the accompanying saffron aioli. 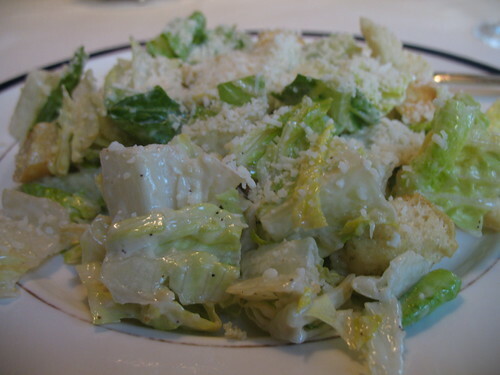 I had a very good Caesar salad. 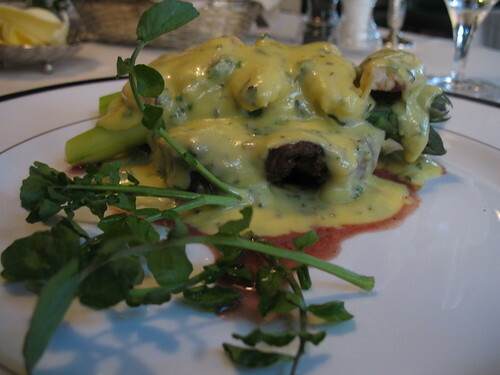 The Filet Oscar was my entree -- filet mignon with Dungeness crab, fresh asparagus and blanketed with Bearnaise sauce. It was like an amalgamated surf and turf. Great. 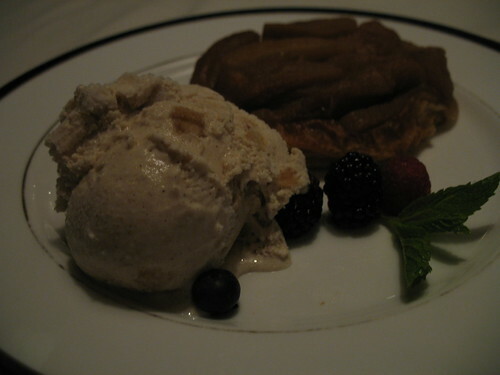 Dessert was apple tart tatin -- warm apples atop a flaky buttery crust with apple ice cream. Love. My steak was substantial enough that I brought some of it home. Mr. Monkey snarfed it up the next day. 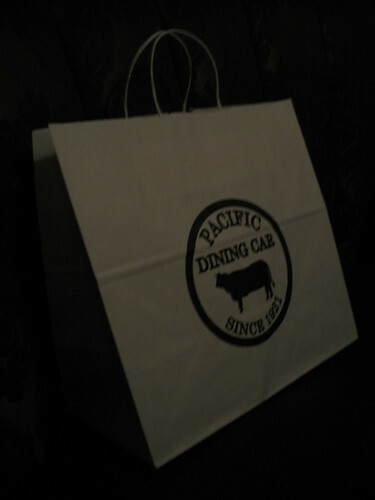 PDC is my go-to place for traditional steak. 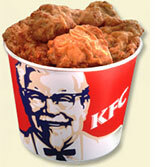 It's the ideal place if you want food that is high quality and classic. Thanks for a great dinner, Mansmell! oh steak. yum. i've been craving cow for a few days now. 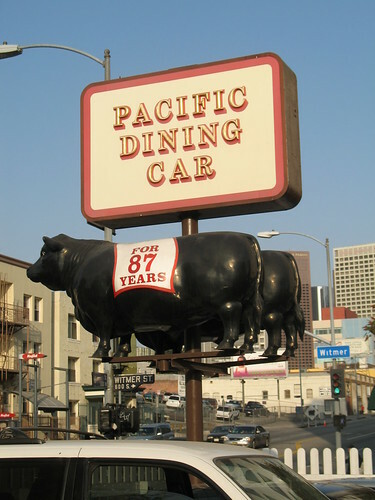 so sad, but i only think of the big green and blue buildings (and soon to be red) in west hollywood when i hear "PDC." Mmmmm. I need to go here. I'm finding that all the classic, old-school joints are closing and being replaced by hip and trendy establishments. This makes me sad. I'm Googling that long A word right now. Me no like big words. Yum! I love that place! I love that restaurant! So old-fashioned. sorry you low but at least chomping on cow makes it better. right??? Food can almost always produce a smile. But just in case it's not enough, I've got a hug for you. i've got to get the hub to this place - it looks like his kinda joint.